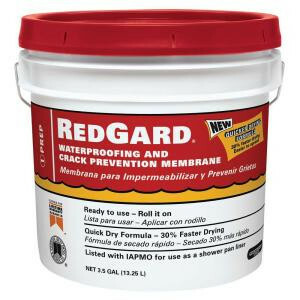 Full information about Custom Building Products RedGard Waterproofing and Crack Prevention Membrane 3-1/2 Gal. RedGard 3.5-gal. Waterproofing and Crack Prevention Membrane is a ready to use waterproofing and crack prevention membrane for tile and stone installations. Just roll it on and let it dry. The membrane dries quickly. Specifications of Custom Building Products RedGard Waterproofing and Crack Prevention Membrane 3-1/2 Gal.